In the race to win in this world, you must run fast. You must always try to push your limits and do a little more than your capacity!But what after that? What after the day ends? You are broken and exhausted and can’t even think about starting a new day tomorrow! Well, that’s where the role of Steam Generators comes in. Steam generators give you the experience of relaxing spas and saunas in the comfort of your own homes! But to choose between the hundreds of models across the market is a laboring task. So we thought we would do it for you! Here we have compiled a list of the best steam generators on the market for you to own. The main factor that you need to consider while choosing a steam generator is your requirement of steam output. Every model has its own steam output power and you have to make the decision whether you can do away with a low power low steam model or you need a high powered high steam version for a more relaxing experience. Then the question comes to how much space do you have. The model you choose should be compact enough to be confined in the space that you actually have to install it in your house. There are models available which are so compact that they can even fit in an empty wardrobe compartment! Other factors that you should consider are its ventilation, safety measures and easy to use interface. An ideal model should always include an explosion-proof body and leakage protection. There are now models available on the market that are digitally controlled and are thus easy to use. 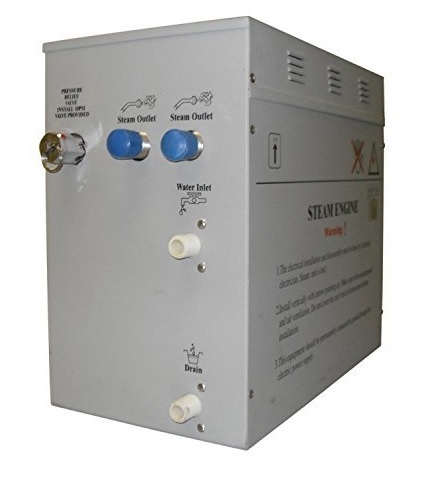 A 12kW heavy duty steam generator, this model is a durable and powerful steam generator which is ideal for your home use. The more the steam is, the more you can benefit from your product! It comes with 1 Phase Steam outlet and 2 chrome steam outlets and it takes up about 460-700 cubic feet of space. A useful feature of this particular model is the self-drainage system. 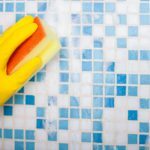 You would not have to worry about steam being condensed on the floor, making it a slippery surface. The self-drainage lets the floor remain as dry as it possible and thus keep you safe from slipping. Its controls are waterproof and programmable so you won’t have to worry about them getting dysfunctional in steam. But still, if you desire to keep them extra safe, just in case, there is also an option of planting them outside the shower as it comes with a 16 feet long connecting wire for the control panel! Other features to look out for are a temperature sensor and aromatherapy outlet, which is our personal favorite! This product is rated a perfect 5 star on Amazon and is an ETL certified steam generator, so the quality is almost warranted for! A reviewer on Amazon does on to say that he had a great experience with the company’s quick customer care, as well as the product which he claims was even better than his gym’s commercial grade unit! He confirms that room is filled with steam in a total time of 5-0 minutes, which is incredible! This is just a lighter version of the first one with 9 kW of power, so the steam output would be a little less all over, but in all fairness, it just might be enough to keep a small family relaxed! You probably won’t need so much steam when you are using it for residential use and so 9 kW is a preferable size when you considering to buy for your house.Its control panel can also be mounted both inside the steam bath and outside the bath! It too comes with a 16 feet long connecting wire to the remote console. But even in the case when you want to mount it inside to conveniently change the settings in between the bath, you can do it without any worry because the buttons are waterproof and can withstand the steam inside. It also includes one of our most favorite features, the aromatherapy outlet which gives you the option of possibly a more peaceful experience. Features like temperature sensors are also something to look out for in this particular compact size model!! A reviewer of the product on Amazon goes on to say that this generator was just perfect for his home use. He praises the company’s quick response customer team which had helped in installing the generator! Another reviewer appreciates the self-draining feature, which according to him, keeps the shower clean and last longer! This product is made especially keeping in mind the residential use audience. It is highly compact, occupying a measly 220 cubic foot space in your house. This can literally be fitted inside an almirah or on an empty shelf near your bathroom. This product also stands out in durability as it features stainless steel construction and solid state circuitry all over its metal body. It is designed to last for years of no maintenance. Its body is also covered in a Limited Lifetime Warranty! But even in the case when you want to mount it inside to conveniently change the settings in between the bath, you can do it without any worry because the buttons are waterproof and can withstand the steam inside. Although it does not come pre-equipped with a drainage system, it has the option of adding on an auto drain which will enhance the performance. It is easy to install its remote controllers, due to them being just like telephone connectors. Even its overall installation is made very easy, as its controls and the plumbing hookup and electrical lines are similar to those of your existing hot water heater. Although what we don’t like about this product is its extremely less steam output. At only 7 kW, it is one of the least capacity steam generators on this list! It has a rating of 4 stars on Amazon and a reviewer has condemned that he has been using it for two years now and goes on to tell about his previous generator from Steamist which lasted 14 years! And coming onto that, Steamist is a really trustworthy brand since it has been around for over 40 Years in this business now and even goes to offer lifetime warranties on its products with excellent customer service which really shows its confidence in its own products. At just $176.99, this product is the most economical option on this list! It is utterly compact for home use too. At only 180-250 cubic feet, it takes up very less space in your house and can be fitted almost anywhere you want it.It has a temperature setting range from 95-131’ F and a time setting range from 1-60 minutes, which make it versatile and useful. It also houses the option to add Auto Drain which would keep the generator clean and working. It has a very useful feature that is a fault self-diagnosis display function, such as leakage protection, high-temperature protection, over voltage protection, water protection, and liner pressure safety protection. Thus it can be said that safety is a major concern for the makers of this product! It runs not only a useful display but an attractive one too, with an LED digital display for temperature and shutdown time. Other features to look out for in this product are Ozone sterilization function; digital timer and water temp control. It also features a ventilation fan for better air circulation so that the steam does not condense on the floor and make it slippery! The only thing we don’t like is the capacity, which is 6 kW, the lowest on the list! But seeing its price is 4 times lesser than the cheapest of all other options, we would say it just about justifies its shortcoming! With a 3.4 star rating on Amazon, it seems to be doing quite well in a monopoly market for such products. A reviewer on Amazon says that when he replaced his 14-year-old Steamist with this cheaper alternative, he found out that this one actually produces steam faster than their Steamiest! The main focus of this product is quality of steam. 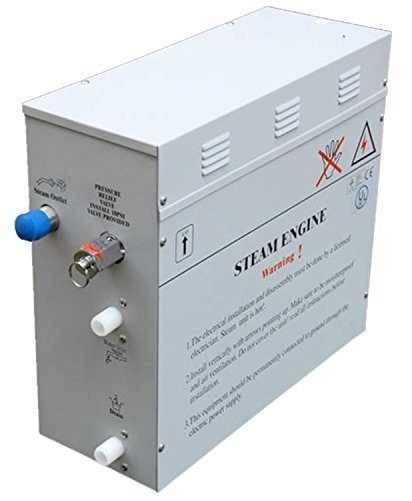 The steam generator motor in this product is made by the market leaders and the most respected manufacturers in the market, Steamist, which brings a certain faith in quality for this particular product! High-quality components and stainless steel have been used in this product to make it durable and able to give out good quality steam for years. It is highly compact and can be fitted into any corner of your home, even under counters or in nearby closets! This makes a huge plus point for this product as one of the main concerns when bringing in a steam generator is space in the house! It is very easy to purchase and install on your own. The package includes the generator, the inside control (in polished chrome, brushed chrome, or polished nickel), the steam head, and the cable. With elaborate instruction manuals also available in the package, it becomes easier for the common man to set it up on his own! It has the same custom temperature and timing features as all the others on this list, but what makes it stand out is its best in class warranty. A 2-year warranty on manufacturer and workmanship defects is more than generous and even then, the company offers a limited lifetime warranty for certain parts! 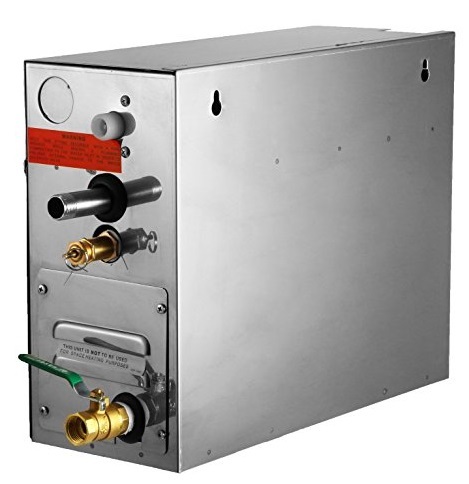 RELIABLE QUALITY STEAM – Our Steam Shower Generator is manufactured by Steamist, one of the Most Respected Manufacturers in the Steam Shower Industry. We use Stainless Steel Tanks and Quality Components for Years of High Quality Steam in your Bathroom. The market of the steam generator is one with highly diverse products that vary hugely in price, features and steam output. Hopefully you’ve gotten a better idea of what you’re looking for in our steam showers reviews list. There is no one best product. Any product that fits your requirements exactly can be your best product. But still, to narrow it down for you we had made this list of the best steam generators to make it easier for you to choose the best one for you. We sincerely hope it helped and that you have now enough information about the products to make an informed decision! A steam shower generator plays an essential role in your shower or bathroom. It is used to heat water to boil and the end result is steam. A typical steam shower generator uses 2 to 5 gallons of water. Inside the steam shower generator, the water interacts with a heating element and is converted to vapor and sent to the steam shower by the heat pressure. There are many factors that are considered before creating a steam shower room, from choosing the right control to selecting the tiles but the most important component in every steam room is a steam shower generator. Without it, there would be no steam and hence it is important to understand how it works. A steam generator connects to home’s plumbing. It has a heating element that when it is turned on, it boils the water to produce steam which is delivered to a shower room. The steam generator is supposed to be installed 25 feet away from the shower room. It is mostly installed in the attic, under a vanity, in a closet or under the floor. It has control panels to monitor temperatures which are mounted inside or outside the steam shower room or both. In case of both control panels, the inside shows the exact temperature while the outside control automatically shuts off after the time it was set elapses. Each generator has specific power rating. The higher the rating, the more it produces steam. A good steam generator produces enough steam for shower room. It is therefore good to know your room or enclosure measurement in order to purchase the generator fit for it. Understanding the steam shower basics will ensure that your shower room will be able to handle the excess steam created by your steam shower generator. -A steam shower generator weighs approximately 30 pounds. -Most of them are the size of a briefcase and can be hung on a wall or mounted on the floor. -A steam shower generator does not require a fan to cool it though it is crucial you follow manufacturer’s installation details. -some have water proof programmable controls and self drainage feature to keep your shower room floor dry. -Extra features of some steam shower generator include temperature sensor and aroma therapy outlet. -Safety is a major concern to most people and so steam shower generators that come with self diagnosis display function will be highly recommended. -Most commonly installed places are basements, walls, utility rooms and crawl spaces. -Some steam shower generators uses 1 large heating element to change water into steam while others uses 2 or 3 heating elements. 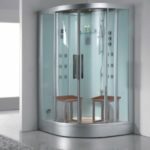 -Most manufactures of steam shower generators offer speedy options, like InstaMist by Steamist which produces large volume of steam under a minute. -If your generator is small, it might not produce more steam like a big and powerful generator but it is ok if you have a small family. 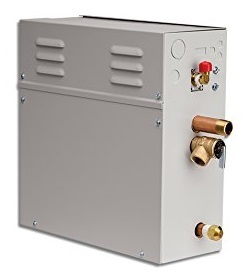 Small steam shower generators take small space in homes. Steam showers have been trendy at health clubs, spas and gym because of their power to relax muscles, invigorate tired bodies and sooth aching joints. Steam shower generator manufactures are now focusing on the home market to offer luxury and comfort. Because steam showers are new to most homes, most people don’t know what to look for when buying a steam shower generator. This guide will help you to choose a generator suitable for your needs. Make sure your shower room will handle a lot of steam. Ensure you have vapor tight doors and enclosure that will not be affected by excess moisture. Buy the right size of steam shower generator that will fit your space. It should have a good warranty, from 1 to 3 years. It should be able to quickly produce steam within few minutes. A good steam shower generator should run quietly and produce consistent steam. Popular steam shower generators are sold by the following brands; Steamist, Mr.Steam, SteamSpa and Steam Planet. You will pay from $150 -2500 depending on its size and other features. When purchasing a steam shower, you will have an option of choosing a complete kit with an enclosure or you can buy a steam shower generator and build your own enclosure. The fastest way to have a steam shower room is to buy a complete kit and comes with shower heads, shower enclosure door, steam shower generator and steam dispenser. 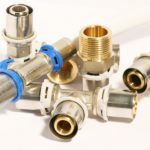 -Ensure you have the needed plumbing and electrical connections in place. Choose a steam generator and a controller that is suitable for your home. A controller will enable you to choose temperature that you want. Choose the perfect location where you will install the generator. Install it near a water supply for water intake and to produce steam and an electrical outlet for heating water. Steam shower generators are supposed to be installed in an area within 25ft of your steam shower and protected from freezing. It should not be installed directly adjacent to your steam shower. 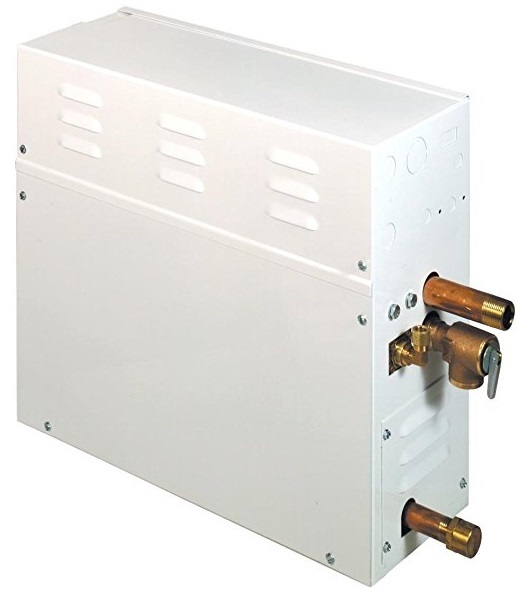 Your steam shower generator will need to be connected to the steam shower room. The valve that produces steam and control unit will need to be connected to the room. Once everything is set up, ensure the shower area is water tight. Getting a steam shower installed in your home has great benefits, from improving your blood circulation to improving health conditions like asthma. A steam shower aids pores to open and hence you will get a deeper cleaning experience. For those who have stressful lifestyle, a steam shower will calm your nerves, improve sleep and sooth tired muscles. We hope this guide was helpful with the information on steam shower generators and it has answered most of your questions. The steam generators that are available on the market right now are both residential grade and commercial grade. The residential models can be used by anyone in the house at all! Whether it be the tired husband who comes home every night exhausted from his day, or a housewife who gets tired handling the house and kids for all day long, or even kids for that matter who automatically get tired every day with running and playing all day, everyone in the family can benefit from such a product. You can even buy a commercial grade steam generator and open up a steam bath shop around the neighborhood as a part-time business. Surely, people from all over your neighborhood will realize the benefits of a steam bath and come to your place to get the experience! • The heat from the steam stimulates the cardiovascular system to expand the blood vessels, increasing the blood flow. As a result, more nutrients are transported to your body. • The opening of pores aids the release of toxins and impurities in the skin, treating problems like acne. • With pores open, shaving and waxing can become incredibly easy and effective. • Steam is ideal for opening up of nasal passages during times of cold, and even curing inflammation. Apart from the physical benefits, there are some other benefits to steam bath also. Sitting in a steam bath with every part of your body being relaxed to the core, you forget the outside world and your worries for a short period ad this lets your mind rejuvenate. This goes to give you mental and emotional benefits that keep your mind stable.